2 by 3 Heroes: Did I buy that? For those that don't know, or have forgotten, I have two children, and neither live at home. My daughter is attending school way north in the Upper Peninsula. My son moved out with some friends years back first to Iowa City, and then to Denver. He's been there 3 years now while my daughter just hit a year a couple days ago. Being that as it is, there is just my wife and I in the house, along with some of their stuff. My son went with the clothes on his back and a couple boxes at first. He has come back a coupe times and slowly got the rest of his stuff - records, clothes, personal items. My daughter has less here, but still has books and other items. Being that school does not start for another couple weeks, my wife was bored and started digging through the pile of stuff my son left behind with the "nope, don't want any of it" mark upon it. We wanted to go through it to be sure we don't missing anything parental, like photos, funny school work and the rest. That's where the hamster went. Two packs of opened 2005 Heritage. I have NO recollection ever buying these packs. Since they were in with a bunch of my son's items, I wonder if he bought them during that short time we were collecting buds. It was a nice find. APTBNL does not have one of these to be shown, so I will get it posted tomorrow, avoiding the pack roulette I currently run on my scan folder. How did I do in the two packs? Only White Sox card in either pack, and a card I already have in the player collection. Luckily, I am certain it's missing from the Sox box, so away it goes. 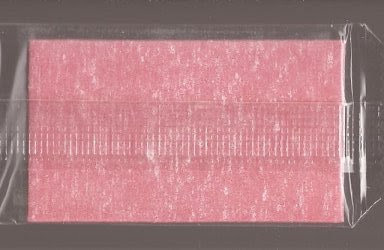 Each pack had an insert. Not too shabby with the two cards. 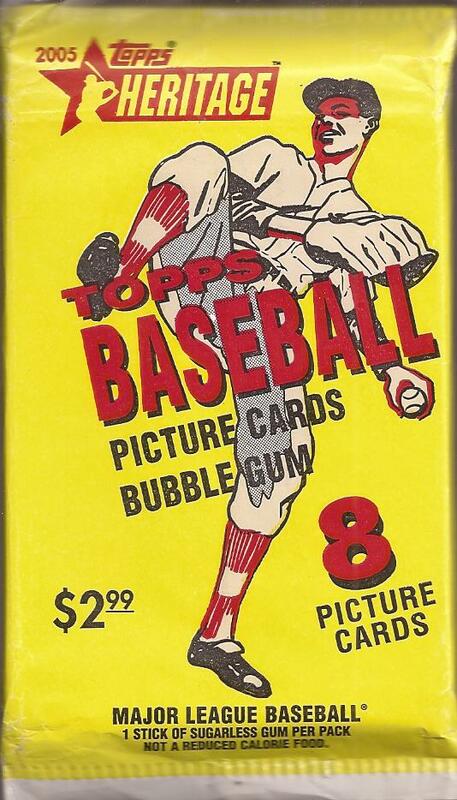 Nice Banks photo, though I am certain I have seen it on other Topps products. 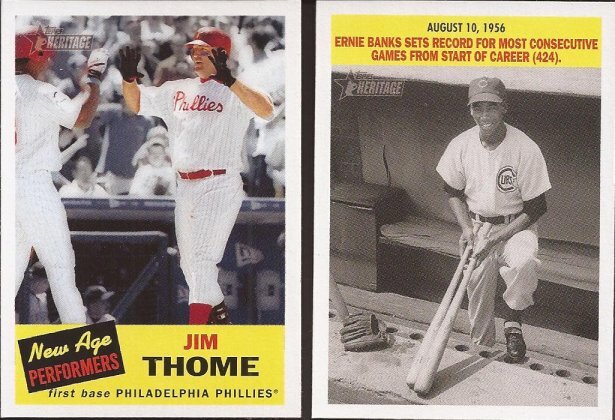 The Thome insert doesn't match well style wise with the set. Just no inserts with Heritage, Topps. You wanna pay homage to the past, do it right. 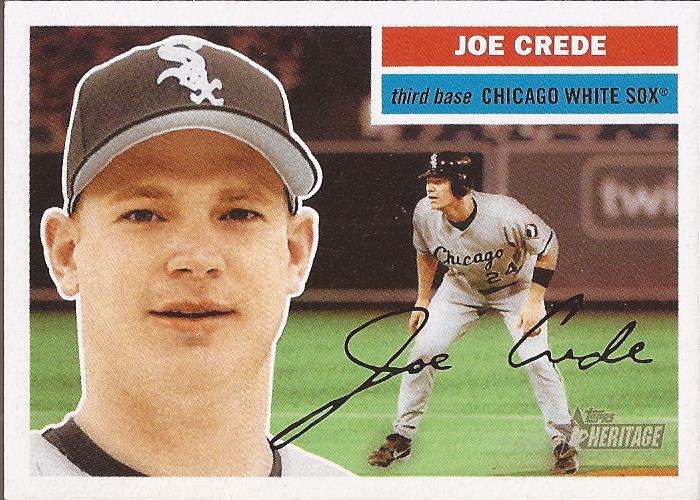 This would have been a nice pull in 2005. Ten years later..... If you remember the '56 design, they had decent backs with plenty of cartoons. Here's the best of the backs from the packs. Nothing like reminding Fullmer about his past two crappy years in the bigs on the IR. 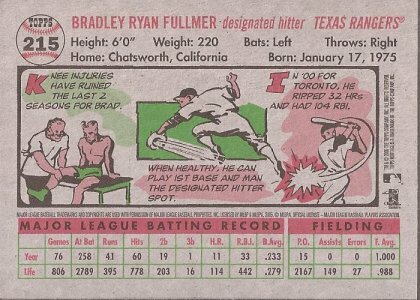 Not often you see a doctor cartoon on a baseball card, and probably not a good sign if yours in the card with it. One of the packs had this gem in it. Yup!!!!! It's still soft! I have a stack of old gum on my bookshelf from old wax packs I've ripped (don't judge me) and I was surprised the condition this stuff is in. I am accepting bribes to make me open & chew it on camera to check the taste. Make your best offer! 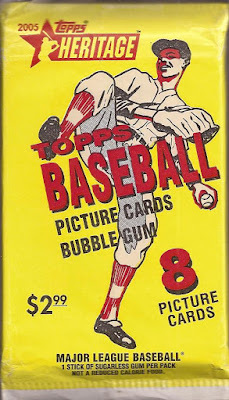 I can't help but read the title of this post in the voice of Urkel... anyway, I ate a piece of gum from '87 Topps a couple years back (because curiosity will kill me after it finally gets the cat) and I strongly advise against following in my stead! My oft repeated mantra on old gum: "If it's brown, put it down. If it's pink, it's ok, I think." I wouldn't think twice before chomping on that Heritage gum. 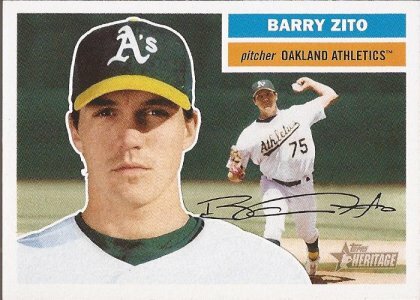 Now, if we're talking 1987 Topps.. I might be a bit more skittish. I bet that 10 year old gum will actually be pretty decent at first, but I bet it loses its flavor after the first five minutes.